Fox 2.5 shocks for 2017 F250/F350 Superduty with leveling kit. Includes two front adjustable remote reservoir shocks (FOX-883-26-044) for 2-3.5″ lift, two rear adjustable piggyback shocks (FOX-883-26-040) for 0-1″ lift, and custom tuning. From city streets to torn up roads, AccuTune Off-Road will greatly improve the ride of your Ford Super Duty. Fox DSC Dual Speed Compression Adjusters are highly recommended for anyone towing or carrying heavy loads. 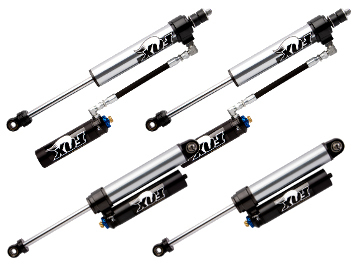 Fox 2.5 shocks take performance to the next level. 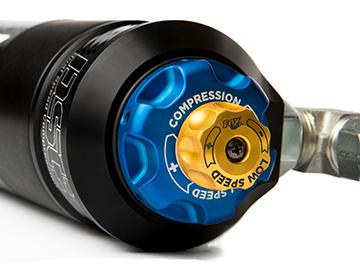 2.5" shocks are better able to handle the heavier vehicles by having more dampening capability and a larger oil volume to dissipate the heat. The result is a smoother and more controlled ride on and off the road.